When you first moved in, you had good intentions: You bought a filing cabinet, carefully folded your clothes into closets and bureaus, and vowed that your kitchen countertops would never be (too) cluttered. But before you knew it (or had even finished moving in), life happened: Opened letters and stray keys carved out homes in nooks, every book became a "coffee table book," and your bed became "storage space" for clothes. 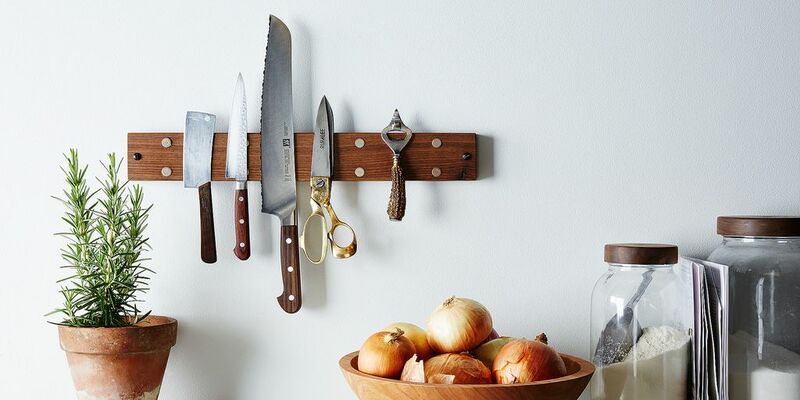 Our new magnetic knife rack keeps knives out of the way, but within reach. In the kitchen, use wall and air space wherever you can. If you're able, hang pots and pans, keep herbs in hanging planters, and retire your knife block for a magnetic holder like this one from Peg and Awl, which will keep your knives out of the way but still within arms reach. Made from reclaimed chestnut and fitted with rare Earth magnets for strength, it'll even look good doing it. You'll be amazed at how much space you free up. 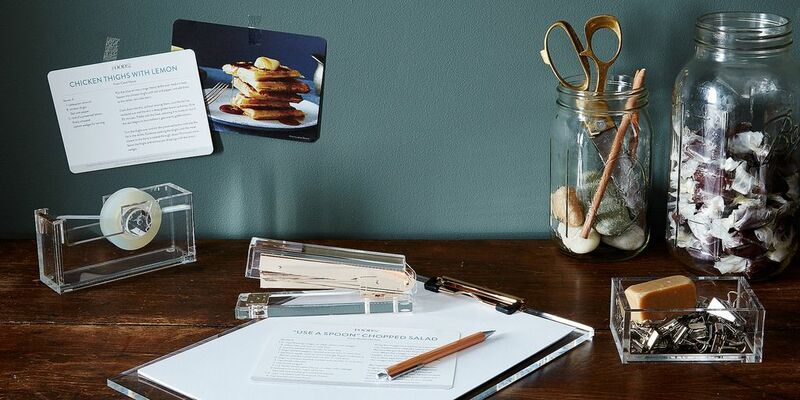 Take a look at your desk and remove everything that you don't use everyday and keep your knickknacks to a minimum—just a cluster of flowers, a special object, and a few beautiful desk accessories are all you need. 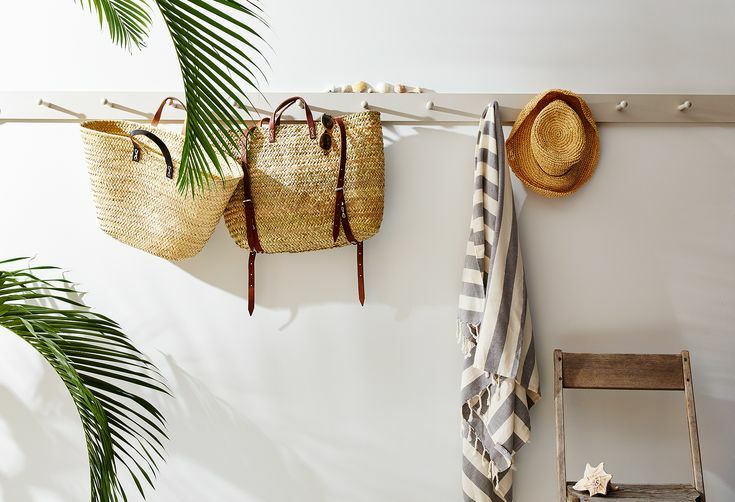 Even if it's just a row of hooks, create a weight-bearing place to hang things up right where you enter your home, so even filled bags have a home that's not on the couch or right beside it. Coats, throws, and umbrellas can also find a home here. 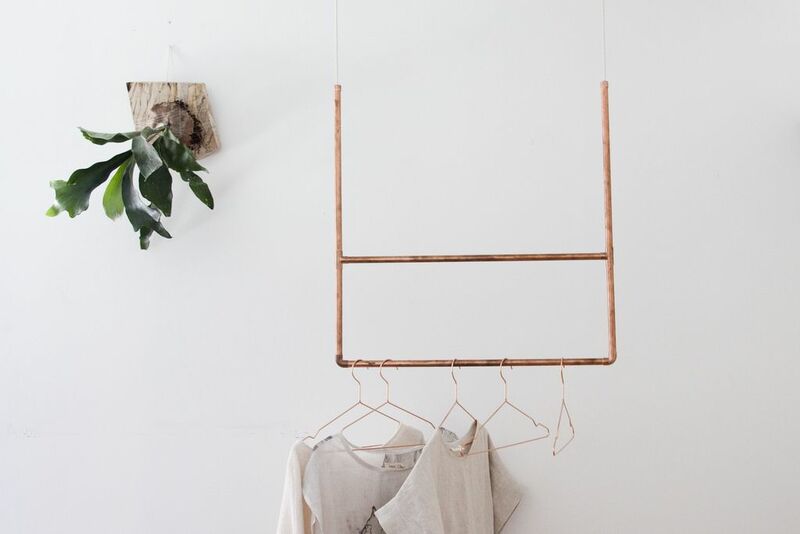 Use storage solutions that can do double duty: a single-level bookcase that doubles as a bench, a butcher block installed with shelves for appliance storage, a mirror that opens to reveal secret shelves, or Madelynn Furlong's copper pipes that come togethre as a hanging rack. They're as easy to make as they look: Just thread a thick cotton rope through pipes and fasten them overhead to a ceiling hook. 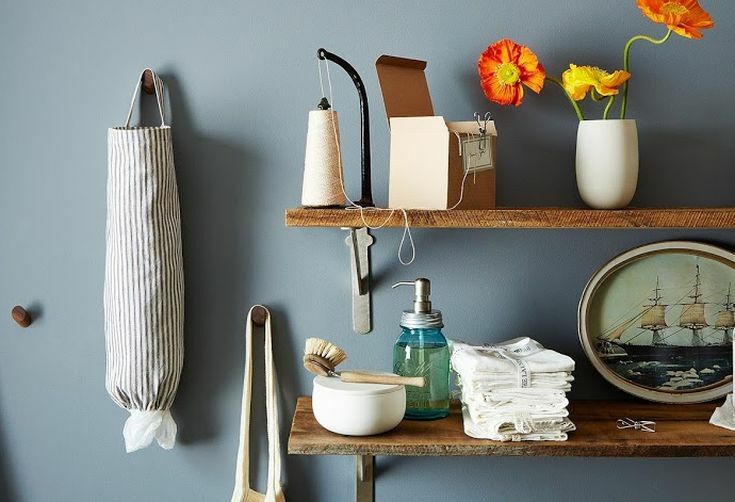 Bathroom shelves can get overrun with all the messy necessities of everyday life—but function doesn't always have to mean sacrificing decor. Take some time to make your shelves beautiful by choosing objects that will house the things you use everyday—a glass bowl to store makeup brushes, shelves for beautiful linens, or an ornate soap dish—then alternate them with things like a vase of flowers or art. If you don't use an item of furniture every day, you may not need it at all. Free up floor space and exercise your creativity by repurposing found items when you're in need of propping up some flowers or a side table to hold your glass of wine. 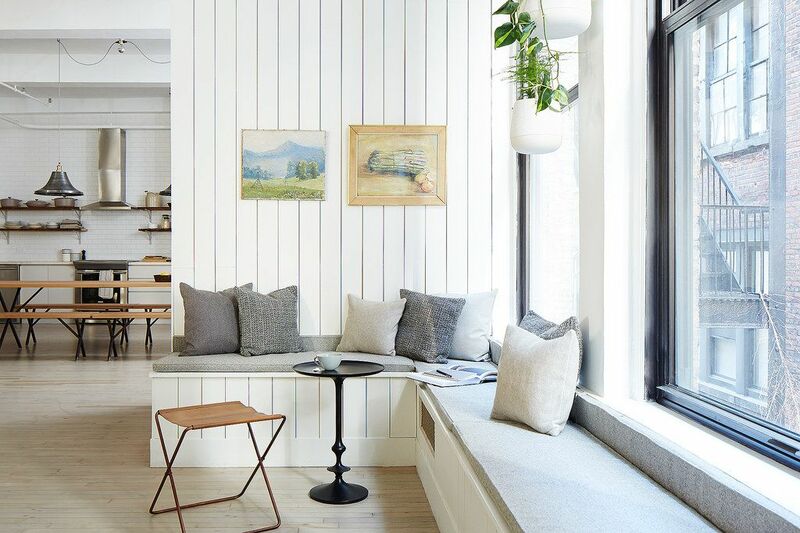 Consider built-ins, like the benches above, which open to reveal hidden storage within them—perfect for tucking away throw pillows or blankets when you don't need them. What are some of your own space saving tips? Tell us in the comments below! This post originally ran last summer, but we brought it back today to ensure a better-organized (for now, at least) new year. I don't think you can "save" space but only apportion it, either filling or leaving it empty. Sometimes full is good, empty is austere. A clutter room or corner makes sense, like a wild patch in the garden. I'm moving from a 3BR, 1700 SF house to a studio apartment and my new rule is "anything that can go in a drawer or on the wall, does". TV - wall mount. Office accessories - in a drawer. Towels - ditto. Lighting - no floor or table lamps. Coffee table - must have a lower shelf. No room for a huge bed - twin daybed with trundle or drawers underneath for extra storage. I like sturdy furniture so many of the items in this article look flimsy to me. The only items that earn shelf space are a few decorative stone carvings and delicate Chinese porcelain!